Let’s talk about CHIPTRACKERS and writing Chiptune music! Re: Let’s talk about CHIPTRACKERS and writing Chiptune music! Quick update: I am steadily working my way through my first Chiptune arrangement! It's a cover of a rather well-known song and hopefully my version will do it justice. (I will have a live singer singing over it) I am still very much in the "note entering" stage; I will still have to go through everything and apply "effects", like panning (?! lol). The balance is pretty good thus far and I am getting the knack of entering values in hex! Ben Asaro wrote: I am getting the knack of entering values in hex! I also love chiptune music, although i am classically trained musician (piano, accordion, music theory, later composition on conservatory), i started in year 1991 to create my own compositions on 8-bit computer ZX Spectrum 128k (Soundtracker, SQ Tracker, Sample tracker) with AY-3-8912 soundchip and 8-bit DA converter in 8255 parallel port (for samples). It was great times at the beginning with cool scene people, diskmags, demos, soon i switched to Amiga 1200 where we developed our first games The Strangers or Napalm (i was composer), and since 1998 i was introduced to video game musicians mailing list (owned by Andy Barnabas), but i strongly battled to respect our chiptune music past, because some composers said it was bleeps and blops up to now. Next 10 years i was focused on big orchestral libraries almost like everyone in the industry, or i spent some years to learn new synthesis like VAST from Kurzweil, but now i am also back for chiptune with two Nintendos (nanoloop mono, lsdj) and with Commodore 64. On C64 i began in great tracker Sid Duzz It (btw, SID chip is far far more advanced than Nintendo's on DMG-01), but i played two years ago at event Demobit where was Goto80 and since then i am slowly learning more live oriented tracker defMON, and believe me, you can be with this tracker something like live coder of sid chip because you have big separate screen with all sid parameters and you can change everything you want in realtime. Although i am pretty good at hard things since i understood VAST synthesis, this is really challenging quest. Happy new year and good luck with chiptune! Martin - I knew you had been involved in the scene back in the day but I hadn't realised to what extent! I was heavily into the demo scene (mainly on the ST but I consumed tracker and chiptunes from all over the place) back in the 80s/early 90s and just had a wonderful hour or so trawling through your various works on youtube - absolutely masterful! Based on some of your comments previously in this thread I've added something to my 'to do' list involving some analogue synths and a hardware sequencer ... the technique intrigues me and I hope applying it in the 'modern' sense will prove quite rewarding! One very useful discipline that has remained with me from those days is making the most of what you've got equipment-wise - most computer soundchips were comparatively primitive, yet with some lateral thinking and plenty of ingenuity you could squeeze a lot more out of them than many people expected. Awesome! Do keep us posted! This is the first song for a new project I am working on, DRAGON'S NEST III: OFFICIAL SOUNDTRACK. It's the soundtrack for a JRPG that doesn't exist. Quick update to this thread. Since I obtained the AY3 module, I added a second AY3 to it and the XOR NerdSeq tracker sequencer. The NerdSeq is based off of the LSDJ tracker but does a few extra things and is actually quite powerful! 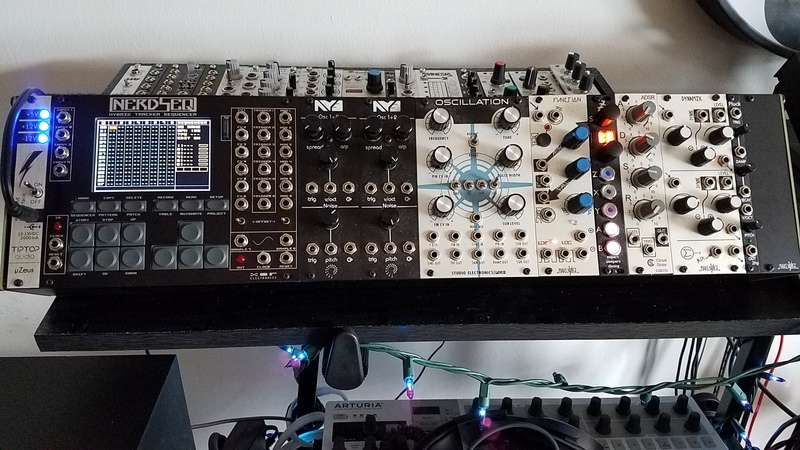 So, I now have two skiffs: one dedicated to 'modular music' with quantizers, LFOs, etc, and one for 'chiptune music' with the NerdSeq, 2xAY3, Boomstar Oscillation, and Disting Mk4. Woo - that looks (and hopefully sounds) impressive Ben! "I used to think I was indecisive, but now I'm not too sure."